This 5th Grade Geometry Jeopardy Game gets students excited about practicing their geometry skills! Students will practice identifying locations on the coordinate plane, solving real-world problems on the coordinate plane, identifying rules between two number patterns, classifying polygons, triangles, and quadrilaterals, and more! 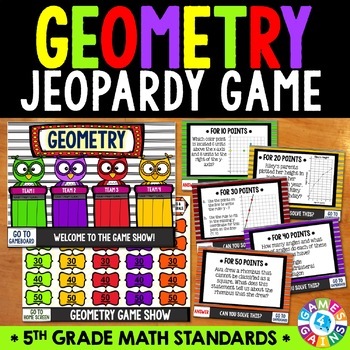 To play the game, students divide into four teams that will compete against one another to answer a variety of math questions and earn the highest score. 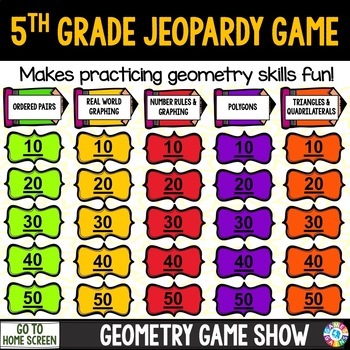 As the teacher, you will act as the game show host by leading students through all of the questions in this fun Powerpoint game and keeping score. IMPORTANT: The version with macros has unique features that enable you to keep score within the presentation itself and to reset both the scores and the game board. However, that version is only guaranteed to work on Windows computers. I've also included a version without macros that can be used on any computer with Powerpoint, including Macs. This version does not allow you to keep score within the presentation, but you can simply record the scores on your blackboard. This Powerpoint game is NOT editable. 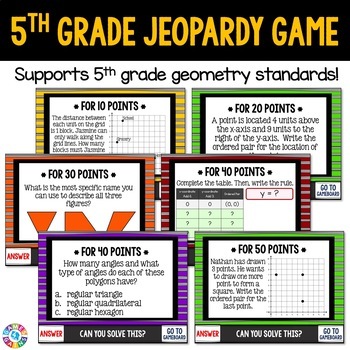 5th Grade Geometry Games Pack - BEST SELLER!